A flexible, incredibly solid mixer with plenty of routing and FX tricks up its sleeve. Flexible routing options. Onboard effects and IK Multimedia X-Gear tie-up. Built like a tank. At this price, it's hard to find fault. UK-based Allen & Heath has a proud pedigree as builders of high-quality mixing consoles, with products aimed at both top-flight studios and venues requiring front-of-house live sound control. The subject of this review is the ZED-10FX console, which boasts USB audio connectivity and an onboard FX suite to complement its capabilities as a studio router and compact live sound console. Crucially, the design matches A&H's larger format mixers, with individually-mounted circuits for each stage, rather than one flat panel, which yields a rugged, tough construction that will suit studio and live sound applications alike. The ZED-10FX's top panel provides all the physical inputs and controls, with just the power inlet and on/off button housed at the back. The first four channels are mono, with the first two intended for mic or line sources and channels three and four set up for mic or guitar/Hi-Z instrument sources. All four channels feature gain and level controls, a high-pass filter with a slope at 100Hz, flexible and open-sounding three-band EQ with sweepable mid-range between 120Hz and 4kHz, sends to the auxiliary and onboard FX buss, a solo button and an extra button to route the signal to a 'record' buss, which is a bonus output allowing you to record a live show, for example. There's a global 48V phantom power supply for the four mic pres which give a warm and open, transparent sound. There are then two stereo source inputs with shorter channel strips - there's no mid EQ or high-pass filter on these channels but that makes sense in the context for which they're intended. These stereo inputs are flexible though, as well as the expected 1/4-inch jack inputs, RCA phono inputs are offered on the first pair, while the second stereo input can receive an additional 'Playback' stereo signal or, by default, route the USB audio input into the mixer at this stage. Despite the compact nature of the console, its potential flexibility is impressive - particularly in a live context. One obvious configuration would be to use two microphone channels for vocals, lead and bass guitar on inputs three and four, with keyboards or a laptop on the first stereo pair. The auxiliary buss could provide monitoring, while the effects could be tweaked for the venue and either be sent to the performers on stage or not, as desired. The gig could be captured via the Record buss and the live engineer could toggle easily between monitoring what's heard by performers on stage or checking the Main mix feed. If you were feeling brave, you could even set AmpliTube up on a laptop and tweak settings in real time for the lead guitarist via the USB connector port! The mixer's master section gives the best indicator of just how adaptable this little mixer can be. There are separate controls for the master output level and Playback buss (where any additional source such as a CD player can be connected for pre-gig warm up music, for instance), while the Playback buss can also be routed through to the dedicated auxiliary buss via its own send level, so it can be incorporated into the mix, or used as a monitoring cue for on-stage performers. The headphone port in the bottom right-hand corner will monitor the main mix by default, but can alternatively provide a feed from the Playback buss, direct from the Auxiliary, or the Record buss, so you can easily check what's being heard at any stage of the input or output process. 'Solo' mode is available on each channel, and this too has its own level dial, while a pair of ladder LEDs provide you with the visual feedback you need. Output-wise, there are also options aplenty as the master balanced outs are flanked by stereo mix inserts, as well as dedicated FX and Auxiliary outputs and RCA phono Monitor outputs - great for live use. One neat touch across the top panel of the ZED is that signal flow possibilities have been mapped out with arrows showing where connections can be internally routed, so if you're new to mixing desks or need to think quickly on your feet in a live sound situation, you can get to grips with where your audio is going and, in this context, the ZED-10FX would also make a great 'teaching console'. Even the USB output is configurable, as it can route the Auxiliary Effects or Record Busses in preference to the Main Mix if you choose, which means you could simply use the ZED-10FX as a USB external effects processor if you liked. 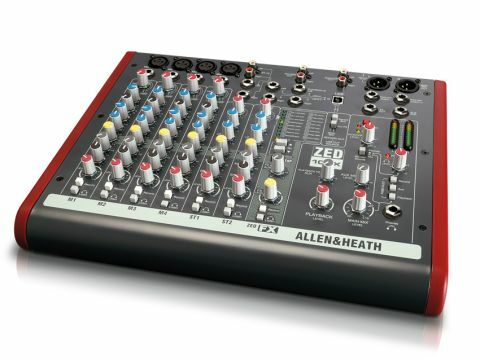 As an audio interface, the ZED-10FX is plug-and-play, with your DAW recognising a new USB connection as soon as you boot up. There are no direct outputs from the individual channels, so you'll find there are only two inputs into your DAW but this is no surprise at the ZED-10FX's price point. The standout internal feature is the integration of FX (hence the name) from Allen & Heath's own larger live consoles, with one of 16 effects algorithms applicable to your mix as you work. These include reverbs and delays (and combinations thereof) as well as flanger and chorus types, and once you've selected the effects algorithm you want, you can adjust tempo using a 'tap' button if applicable, or hold the tap button down to alter the value of a chosen effects parameter. "The standout internal feature is the integration of FX from Allen & Heath's own larger live consoles"
One parameter is assigned to each algorithm, so reverbs can change in size, delays can regenerate for longer and chorus effects can be made deeper, for example. ZED-10FX's launch coincides with a new collaboration between A&H and IK Multimedia as it ships with the latter's X-Gear modular amp modelling system. While this is actually a shell for AmpliTube users to configure their existing amp modelling bundles, the ZED-10FX's bundled version offers three hand-picked models, with mic and stomp pedal options too and can run either within a DAW or standalone. All in all, this mixer is a very rugged, flexible piece of kit that goes a fair way beyond many of its competitors at this price point and even higher. AS such, the ZED-10FX comes highly recommended.